A Giant range of Big Friendly events are being held at libraries across Manchester, to encourage children to take part in the Summer Reading Challenge. The theme for this year’s challenge, produced by the Reading Agency and delivered by libraries, is The Big Friendly Read - linking into the national ‘Roald Dahl 100’ celebrations. 2016 is the centenary of the birth of Dahl, legendary author of The BFG, The Twits, Matilda, Charlie and the Chocolate Factory and a plethora of other classic children's stories. To complete the challenge, children aged from four to eleven are invited to read any six books of their choice from their local library during the summer holidays. They will receive stickers and goodies along the way, plus a certificate and medal when they finish the Summer Reading Challenge. Children can read whatever they like - fact books, joke books, picture books, audio books - just as long as they are borrowed from the library. More than 130 free activities are on offer in Manchester libraries during the school holidays. 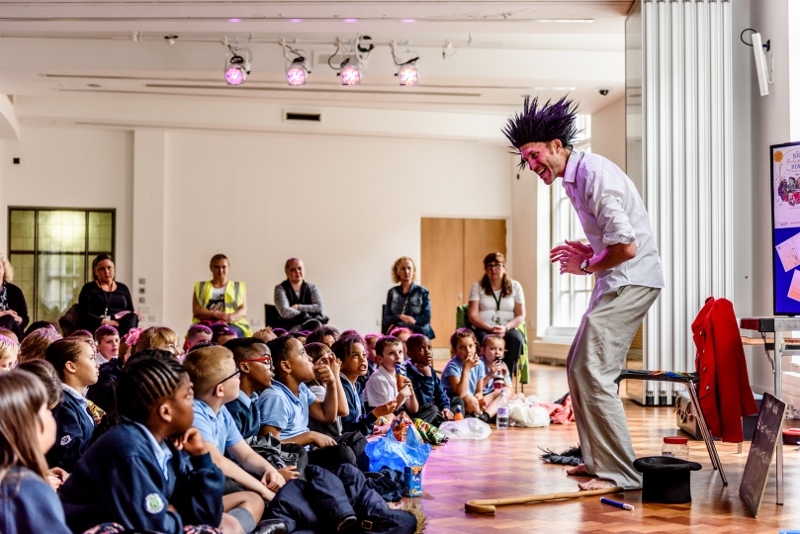 Dahl-themed activities include ‘Sublime Science’, where children aged five and over are invited to watch a 'BFG' science show, featuring snozzcumber slime, an airzooka and whizzpopper juice air rockets. ‘Scrumdiddlyumptious’ sweet craft sessions will give youngsters the chance to use recycled materials to create giant 'sweets', based on the weird and wonderful creations found in Willy Wonka’s Chocolate Factory. Kids will be able to make an Everlasting Gobstopper, a Snozzberry, or a Wonka Bar - or use their imaginations to invent their own ‘gloriumptious’ creation. There's also the chance to create and animate a 3D plasticine model, inspired by Roald Dahl characters. Using stop-frame animation, the children will bring their models to life and create a short video clip. These creative sessions for children aged eight and over are always extremely popular and places are limited, so please check with the hosting library for full booking details. A Saturday Spectacular at Central Library on 16th July gets this summer's programme off to a flying start - join in with the family fun from 12 noon - 4pm. The Summer Reading Challenge runs right through the summer, ending in a special Sunday Funday at Central Library on 11th September, where families will be treated to a Twits storytelling show, a Roald Dahl trail and a chance to meet the picture book illustrator and author, Lynne Chapman. For a full list of Summer Reading Challenge activities hosted by Manchester Libraries, go to www.manchester.gov.uk/summerreadingchallenge.